I keep trying to tell myself I am through with male fantasies, but then I get sucker punched by a really good one. Mastai must either be super woke or just have amazing instincts, because he dances right up to the edge of a number of problematic elements that usually drive me insane (including much of what enraged me about The Lives of Tao) -- and then he tweaks them, or subverts them just so. This is a very, very clever book; it's a finely crafted instrument that Mastai has strung with tons of tropes -- which he then twangs and plucks and makes dance in a unique, deeply satisfying way. I found it romantic and poignant and philosophically challenging. Mastai approaches time travel in a manner I'd never encountered in any other story -- although weirdly, not long after I read it, I picked up The Man From Primrose Lane, which utilizes a similar concept, but completely defangs the idea. Similarly, the recent Dark Matter plays with alternate universes and identity much as Mastai does in All Our Wrong Todays, but again, I found Mastai's version toothier and more dynamic. That said, if you liked either of those books, I think you will love this one. 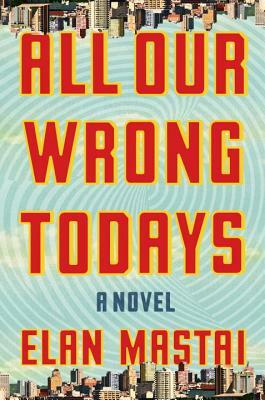 All Our Wrong Todays is a book by a man, about a man, in which the female characters are all seconded to the male protagonist's story and don't really have agency -- and yet, it's also such a rich, human story that I pretty much do not care. Would I prefer to read a version of this book with a woman at its core? Absolutely. But mostly I'm just so happy that this one exists.